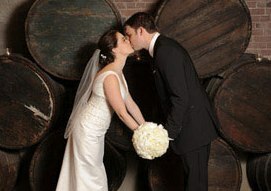 Kimpton Hotel Vintage, offers a gracious downtown Portland wedding venue for your upcoming wedding reception. The boutique Portland hotel rooms and suites provide the luxurious, welcoming, wedding site sanctuary you want for your out-of-town guests and wedding party. Plus, your wedding and event catering is provided by Pazzo, offering the contemporary Italian cuisine of Chef Kenny Giambalvo and a presentation poised to make your wedding reception fairytale perfect.